… an umbrella term describing an advanced level of clinical nursing practice that maximizes the use of graduate educational preparation, in-depth nursing knowledge and expertise in meeting the health needs of individuals, families, groups, communities and populations. It involves analyzing and synthesizing knowledge; understanding, interpreting and applying nursing theory and research; and developing and advancing nursing knowledge and the profession as a whole (CNA 2008: 10). Core advanced nursing practice competencies include direct patient care, research, leadership, consultation and collaboration (CNA 2008). The extent of involvement in each of these activities varies depending on the specific nature of the NP and CNS roles. Titles and activities typically delineate roles within the healthcare system. However, there is confusion about advanced practice nursing titles, a lack of clarity about the roles and role overlap (Griffiths 2006). For our purposes, the term "title confusion" implies that CNS and NP role titles can be difficult to understand and that one role title may be mistaken for the other, whereas "lack of role clarity" indicates that NP and CNS roles are poorly differentiated and lacking in clearly defined role activities. In this paper, we provide an overview of CNS and NP role definitions and characteristics, explicate the title confusion and role clarity issues, and describe their effect on healthcare team and public awareness and acceptance of the roles. We also summarize recommendations that have been made to enhance title and role clarity so that the roles can be better integrated into the Canadian healthcare system. This paper is based on a scoping review of the literature and qualitative interviews completed for a decision support synthesis that was conducted to develop a better understanding of advanced practice nursing roles, their current use, and the individual, organizational and health system factors that influence their effective development and integration in the Canadian healthcare system (DiCenso et al. 2010a). The synthesis methods are described in detail in an earlier paper in this issue (DiCenso et al. 2010b). Briefly, we conducted a comprehensive examination of all published and grey literature ever written about Canadian advanced practice nursing roles and reviews of the international literature from 2003 to 2008. The overall search yielded a total 2,397 papers, of which 468 were included in the scoping review. Interviews (n = 62) and focus groups (n = 4 with a total of 19 participants) were conducted in English or French with national and international key informants including CNSs, NPs, physicians, healthcare team members, educators, healthcare administrators, nursing regulators and government policy makers. When our synthesis was completed, the Canadian Health Services Research Foundation (CHSRF) convened a multidisciplinary roundtable to develop recommendations for policy, practice and research. For this paper, we focused on the concepts of title confusion and lack of role clarity as described in the literature and by our interview and focus group participants. Data from the literature, interviews and roundtable were then synthesized to form the basis for recommendations to reduce title confusion and enhance role clarity. In Canada, NPs are "registered nurses with additional educational preparation and experience who possess and demonstrate the competencies to autonomously diagnose, order and interpret diagnostic tests, prescribe pharmaceuticals and perform specific procedures within their legislated scope of practice" (CNA 2009b: 1). During the early years of NP registration, regulators used various titles to describe NPs, such as "registered nurses providing extended services" in Alberta (Canadian Institute for Health Information [CIHI] 2010: 37) and "registered nurse, extended class" or "RN(EC)" in Ontario (College of Nurses of Ontario 2007). Titling of NP roles is in transition; for the purposes of this paper we refer to NPs who are registered as family/all-ages or primary care NPs as primary healthcare NPs (PHCNPs), and to those who are registered as adult, pediatrics or neonatal NPs as acute care NPs (ACNPs). Work settings and the primary focus of NP practice vary. For instance, PHCNPs typically work in the community in settings such as community health centres, family physician offices, primary care networks and long-term care (CIHI 2008). The PHCNP's main focus is health promotion, preventive care, diagnosis and treatment of acute common illnesses and injuries, and monitoring and management of stable chronic diseases. ACNPs typically provide advanced nursing care across the continuum of acute care services for patients who are acutely, critically or chronically ill with complex conditions; they work in settings such as oncology, neonatology and cardiology (Kilpatrick et al. 2010). The amount of consultation, education, research and leadership activities that NPs do varies depending on the needs of patients and the setting. Education programs exist across Canada specifically to prepare nurses for the PHCNP and ACNP roles, the majority of which are at the master's of nursing degree level (College and Association of Registered Nurses of Alberta n.d.; Martin-Misener et al. 2010). I think we need education that is a standard level of education. So to be a CNS, you must have x, y and z, and then you will get a certificate or something that you can put on your wall that says 'I am a CNS.' The NP exam, you know, they're regulated. Clearly there's an exam. There wasn't for a while, but now there is for the Acute Care NPs and the specialties. I think it adds credence to the role; it really does. And so from the policy perspective, at the government tables, people know what the NP does. I don't think they even know that the CNS exists. Understanding the differences between CNS and NP roles is challenging because they share common role competencies (CNA 2008; Canadian Association of Nurses in Oncology 2001). Figure 1 (Bryant-Lukosius 2004 and 2008) illustrates the differences between CNS and NP roles. At one end of the continuum, CNSs spend proportionately more of their work time on professional development, organizational leadership, research and education activities and may have fewer responsibilities related to direct clinical practice. At the opposite end of the continuum, NPs spend more of their work time providing direct patient care compared to other role activities. Another important difference relates to scope of practice. CNSs are authorized to perform the same controlled acts as an RN. However, NPs have expanded clinical functions and legislated authority to perform additional activities (i.e., diagnose, order tests and prescribe medication) traditionally performed by physicians. The wavy diagonal line in Figure 1 illustrates the fluid or flexible nature of these roles. By definition, advanced practice nursing roles are dynamic and continually evolving in response to the changing contexts and healthcare needs of patients, organizations and healthcare systems (CNA 2008; International Council of Nurses 2008). Our key informants noted that this context-dependent nature of advanced nursing practice made it difficult to understand the roles. No two CNS or NP roles are alike, and the balance of clinical and other responsibilities for individual roles may vary and shift with changing patient health needs and practice priorities in the work environment. Lack of title protection and confusion about CNS and NP titles have been identified in the past (Schreiber et al. 2005a); however, recent legislation throughout Canada has protected the NP title, requiring registration as an NP in order to use the designation (CIHI and CNA 2006). Title protection is not in place for CNSs (Bryant-Lukosius et al. 2010). Healthcare administrators whom we interviewed noted inconsistencies in the requirements for and the use of the CNS title that contribute to the reduced awareness of and lack of role clarity for the CNS role. In Alberta, the title "Specialist" is restricted to registered nurses (RNs) practising in a specialty who have a graduate degree and three or more years of experience in that specialty (College and Association of Registered Nurses of Alberta 2006); however, the title "Specialist" is not limited to the CNS role and may be applied to other nursing roles such as clinical nurse educators. The absence of CNS-specific education programs and the lack of title protection for CNSs in Canada have resulted in contrasting situations where nurses with graduate education and a clinical specialty are working as CNSs but are not titled as such and, conversely, others who do not have CNS qualifications claiming to be a CNS. Both the non-CNS-titled nurse in the role of a CNS and the indiscriminate use of the CNS title contribute to role confusion within and outside the profession. Some of the issues are actually around the title "nurse practitioner," what does that mean to people, and not only to the community but other disciplines as well?… We're still using a lot of different titles. We're still using advanced practice, nurse practitioner, nurse practitioner specialist, nurse practitioner primary healthcare, nurse practitioner family-all ages. So I think that's confusing in itself around the title. I think that the CNS is probably less understood than the NP. I think there's still some misunderstanding about NP kind of practice, but I think the CNS role is … perhaps not as well known … because of the kind of things that they're involved in. They're involved more in a systems level and a research level and consultation level, so I'm not sure that it's well understood. I think that's shown by the fact that a lot of times people were demanding an NP position when really what they wanted was a CNS. Well, actually I get a little lost in the nomenclature about APNs versus NPs versus CNSs plus or minus master's. They're not well understood I think, on the medical side, and even for somebody like myself who is actually involved in and supportive of the idea, I still don't understand a lot of the nomenclature, what the difference is, what the expectations might be. Clearly, title confusion and inconsistent titles make it difficult for healthcare team members and the public to discriminate between CNS and NP roles. In a systematic review identifying barriers and facilitators to advanced practice nursing role development and practice, Lloyd Jones (2005) identified role ambiguity as the most important factor influencing role implementation. The ambiguity was related to confusion among stakeholders about the objectives, scope of practice, responsibilities and anticipated outcomes of the roles (Lloyd Jones 2005). This was consistent with the key informants in our synthesis, many of whom directly associated lack of role clarity with lack of planning for the role, explaining that without clearly defined goals, the outcomes and potential impact of CNS and NP roles could not be adequately identified or evaluated. Similarly, in a large study of PHCNPs in Ontario, an important contributor to role clarity was the purposeful matching of the skill and experience of the NP hired into a position with the practice setting expectations for that role (DiCenso et al. 2003). We had the NPs start to practice before anyone really understood what the role was. So the individuals were in place and everyone was trying to figure out what are you going to do, and I don't know that this is true in every hospital but whenever we introduce a new role it always seems as though you might be stepping on another's role. Participants also indicated that the lack of clarity between the CNS and NP roles limits the ability to actualize the appropriate and full scope of each role and in turn leads to issues with role sustainability, particularly within the context of competing system and fiscal priorities. Lack of clarity regarding NP and CNS roles can influence decisions about if and how these roles are funded. For example, participants identified that while the funding for both CNS and NP roles is vulnerable to economic downturns, the CNS role is more at risk because the direct impact of this role on patient care and the organization is not readily visible to those who do not understand the role. If funders do not understand the full potential or scope of CNS and/or NP roles, then they may be apt to fund a more established or well-defined role to attempt to meet their needs. Lack of role clarity contributes to an inadequate awareness of the CNS and NP roles among healthcare team colleagues, and this can influence their acceptance of the roles and ultimately the success of role integration (Alcock 1996; Goss Gilroy Inc. Management Consultants 2001; Irvine et al. 2000; Lloyd Jones 2005; McNamara et al. 2009). Lloyd Jones (2005) notes that role ambiguity may underlie healthcare professionals' negative attitudes toward advanced nursing roles. She suggests that changes in role boundaries create uncertainty in relation to professional identity, leading to increased stress and unproductive behaviour such as communication breakdown. Multiple reports from our scoping review documented that healthcare team understanding of CNS and NP roles is a facilitator for role integration (Besrour 2002; Davies and Eng 1995; Jones and Way 2004; Roschkov et al. 2007; Schreiber et al. 2003). The importance of increasing team awareness about CNS and NP education, certification, scope of practice, roles and, where relevant, liability coverage was emphasized (e.g., Centre for Rural and Northern Health Research n.d.; DiCenso et al. 2003, 2007). If they [patients] go to the hospital, they'll get the question, "Who is your doctor?" "I have a nurse practitioner." "Well who is your doctor though?" So it's not helping when other healthcare providers don't acknowledge our [NP] role. Inadequate professional awareness of NP and CNS roles leads to ambiguous role expectations within healthcare teams, turf protection and concerns about whether the CNS or NP is practising outside their scope of practice. This is especially pronounced when roles overlap among healthcare team members. Healthcare team participants in our interviews expressed their uncertainty about the nature of NP and CNS roles. They noted that the lack of written information about credentials, scope of practice and drug formulary approvals contributed to this uncertainty. They described turf wars as team members renegotiated their roles and feared their roles would be replaced by a CNS or NP. To maintain quality and sustainable patient care, participants identified that many professions are adjusting to role shifts and overlap in the activities carried out by other healthcare providers (e.g., physicians and NPs, NPs and RNs, CNSs and RNs, and RNs and practical nurses), engendering understandable fears related to loss of autonomy and control that can lead to resistance. Participants identified that ultimately, healthcare team collaboration depends on respect, trust, a mutual understanding of one another's roles, a willingness to negotiate specific role functions based on patient needs and team goals, a non-hierarchical structure, and the perception that everyone is "getting more out of it than they are losing." In the study of PHCNPs in Ontario described earlier (DiCenso et al. 2003), challenges with other healthcare team members were most often related to role expectations and the lack of role clarity between RNs and NPs, particularly with respect to the support expected of RNs by NPs in regard to daily activities, and the expectation of RNs that NPs should contribute to nursing care activities when needed. The lack of role clarity had the potential for a negative impact on team communication and professional confidence, particularly for newly graduated NPs who were making the transition from the RN role. A lack of understanding and support of NP and CNS roles by the nursing community was documented by others (de Leon-Demare et al. 1999; Haines 1993), and Higuchi et al. (2006) reported role confusion between the CNS role and other nurses. The staff nurse participants in our interviews did not describe conflicts or strain with CNSs and NPs, although they did report challenges in understanding the nature of the roles. Regulators and administrators reported that some staff nurses perceived NPs as being aligned with medicine and sometimes had difficulty seeing the NP's contribution to nursing. PHCNPs agreed with the regulators' perspective and added that the strained relationship that sometimes occurred between themselves and staff nurses was also related to salary differences and feelings of professional alienation among RNs. Healthcare administrators noted that the NP role was understood more easily once healthcare providers had interacted and worked with the NP; however, they did not believe this was the same for the CNSs. Government participants identified a lack of understanding about the differences between NPs and CNSs among health authority managers and said that both roles were best understood by physicians who worked closely with them and by healthcare administrators who employed them. Inadequate public awareness of CNS and NP roles has also been identified as a barrier to their integration (Desrosiers 2007; DiCenso et al. 2003, 2007) and is associated with title confusion and lack of role clarity. All nursing, regulator, administrator, educator and government interview participants noted the lack of public awareness of CNS and NP roles. Regulators identified that it was sometimes difficult for the public to know which services were provided by which nurses, for example, when both an RN and an NP worked in a primary care setting. This was also a finding in a study that investigated parental willingness to be seen by an NP in a pediatric emergency (Forgeron and Martin-Misener 2005). The study authors found that many parents lacked an understanding of the roles RNs have in an emergency department, and this hindered their ability to comprehend the role of NPs. In our study, a variety of interview participants stated that they perceived there was greater public visibility and awareness of the NP role than of the CNS role. A CNS working in a First Nations community stated, "One of the biggest barriers that we deal with is that people … First Nation communities … don't know what to expect from the [CNS] role itself." Some of the patients are not used to seeing a healthcare provider outside of their family physician. So for those who are not familiar with the NP role, there's anxiety over what may be deemed to be a less qualified person providing services. So it's still that referral or … assurance that their physicians know [they are seeing an NP]. Although for the patients who have experience with NPs, either from coming from other provinces or other countries where they have NPs, they look for them or they ask for NPs. And that's actually the group that is most vocal in terms of questioning why they don't have any NPs in their communities. An administrator in a health authority recounted that by making the work of the NP role visible, public support grew in the region and facilitated role implementation. A number of key recommendations to enhance title and role clarity were identified through our review of the literature, in key stakeholder interviews and by the CHSRF roundtable. A single title to capture all advanced practice nursing roles, such as CNS/NP or APN, was not supported by our interview participants. Those who had experienced the dual role found the single title confused their co-workers and patients. A recent policy document written to clarify the role of oncology CNSs and NPs also recommended avoidance of the term APN as a role title (Cancer Care Ontario Oncology APN Community of Practice 2009). Clear and consistent CNS and NP titles and roles would reduce confusion about their purpose and contributions, and it would enable each to address specific needs of patients and organizations. Attaining such clarity and consistency would also facilitate streamlining and standardizing education for NP and CNS roles. The adoption of consistent titles for NPs across Canada was recommended by the CNPI (2005). Specific to role clarity, the most frequently and consistently mentioned recommendation at the CHSRF roundtable was that the CNA should lead, in collaboration with other health professional stakeholder groups, the creation of vision statements that clearly articulate the value-added role of CNSs and NPs across settings. These vision statements should include specific yet flexible role descriptions pertinent to particular healthcare contexts; this would help address knowledge and implementation barriers deriving from lack of role clarity. Confusion is likely to occur when CNS and NP roles are not linked to clearly defined patient and healthcare system goals and when key stakeholders are not involved in the planning process (Bryant-Lukosius and DiCenso 2004). Tools are available to assist in effectively planning for and implementing NP and CNS roles. For instance, a national framework (CNA 2008) is in place to help define CNS and NP roles, and several toolkits have been developed to guide and assist with role implementation for NPs (Advanced Practice Nursing Steering Committee, Winnipeg Regional Health Authority 2005; CNPI 2006a) and CNSs (Avery et al. 2006). 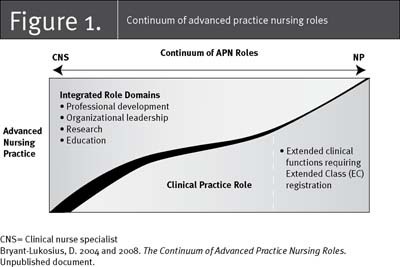 In addition, the PEPPA (participatory, evidence-based, patient-focused process for advanced practice nursing role development, implementation and evaluation) framework provides a clear process for determining the need for and implementing new advanced practice nursing roles (Bryant-Lukosius and DiCenso 2004). The framework has been used successfully to introduce advanced practice nursing and other advanced provider roles in orthopedic joint replacement (Robarts et al. 2008), cardiac (McNamara et al. 2009) and long-term care (McAiney et al. 2008). The framework promotes role clarity and understanding of CNS and NP roles through stakeholder education about the roles and through improved role planning and healthcare team involvement in developing the role description. Lloyd Jones (2005) recommends that when new CNS and NP roles are introduced, clear role definitions and objectives be developed and communicated to healthcare team colleagues. Government interview participants indicated that a strategic communication plan about NP and CNS roles is needed to achieve full integration, acceptability and support for the roles within healthcare teams and to increase public awareness of the roles. All participants echoed this, emphasizing the need for deliberate communication at the local, provincial and national levels to educate all stakeholders in order to achieve a broad-based awareness and understanding of the roles to maximize patient care. There was a strong recommendation by NPs and CNSs for professional nursing associations to conduct a far-reaching communication campaign. Media releases were specifically suggested; for instance, British Columbia issued a media release when the province reached 100 NPs (Fayerman 2008). A television commercial in Nova Scotia was a first step in succinctly communicating the NP role to the public and other healthcare providers (NPCanada.ca 2008). Following up on what the CNPI (2006b) began, developing a national nursing media campaign to highlight NP and CNS roles, repeated and/or updated every six months, would enhance and maintain public awareness of the roles (Matthews et al. 2007). The CHSRF roundtable also recommended that a communication strategy be developed (via collaboration with government, employers, educators, regulatory colleges and professional associations) to educate nurses, other healthcare professionals, the public and healthcare employers about the roles, responsibilities and positive contributions of CNSs and NPs. Physician champions can do a marvellous job of turning things over with their own colleagues. Giving people the opportunity of experiencing the role really is probably the biggest selling point of what you can do with it, and then being flexible for when you have that role and making sure that you structure the role so that it truly is an advanced practice role. At the team level, interview participants suggested a number of strategies to promote inter-professional relationships between CNSs and NPs and the healthcare team. For example, they suggested that administrators and managers involve team members in creating a "fit" between the various scopes of practice represented on the team and the role of the inter-professional team as a whole in meeting patient needs. Some healthcare team interview participants described their involvement in educating NPs and CNSs in the clinical setting and appreciated being involved early in determining what training would be needed; they felt this collaboration helped them understand the roles. The study of PHCNPs in Ontario (DiCenso et al. 2003) revealed that the most important facilitators for improving role clarity were identifying the patient needs that NPs were expected to meet; understanding healthcare team members' practice styles and readiness to implement an NP role; circulating a written description of the NP role to team members; providing education about the role; and allowing time for the NP, physicians and other team members to get to know one another, including their mutual practice styles. Finally, to familiarize health professionals with the roles, responsibilities and scopes of practice of their collaborators, the CHSRF roundtable recommended that curricula across all undergraduate and postgraduate health professional training programs include components that address inter-professionalism. Though numerous studies have demonstrated the effectiveness and high levels of patient satisfaction with NPs (Horrocks et al. 2002) and CNSs (Fulton and Baldwin 2004), title confusion and lack of role clarity pose substantial barriers to their full integration into the Canadian healthcare system. These barriers stem from the use of a variety of role titles, the absence of systematic planning to explicate the specific role definition and objectives, inadequate communication with healthcare team members and the public about the role dimensions, and failure to address inter-professional team dynamics when these roles are newly introduced. NPs are licensed practitioners and their title is protected. For healthcare colleagues and the public, this means that those calling themselves NPs have a specific scope of practice they are licensed to perform, affording a degree of standardization and clarity to the title. However, confusion arises in the various terms used to describe NP specialties. For example, in some jurisdictions, NPs who work in the community are known as primary healthcare NPs, while in other jurisdictions, they are known as family or all-ages NPs. NPs who work in acute care have for some time been known as acute care NPs but now are called specialty or specialist NPs or, more specifically, adult, pediatrics, or neonatal NPs. As time goes on, additional specialty titles may emerge, such as geriatric NP and mental health NP. Such titles are likely helpful in conveying the NP's area of specialized knowledge and expertise to colleagues and the public. To reduce the confusion caused by different titles for the same specialty and to facilitate national communication campaigns about NPs, nursing regulators across the country should consider agreeing on common specialty titles. Because the CNS title is not protected, health administrators and managers who are hiring CNSs should ensure that those being considered for the position meet the basic qualifications of a CNS (i.e., graduate education, specialty practice area, skills in system change). Consistent application of these criteria across the country for all CNS job postings would go a long way to ensuring that those who hold CNS positions are appropriately qualified and would help reduce title confusion. Once the CNS was hired, title confusion would be further reduced if the position was titled CNS with specific roles and responsibilities (e.g., diabetes education) incorporated into the job description rather than into the title. These strategies would also facilitate national communication campaigns about CNSs. To further support this, educators are encouraged to develop graduate education programs specifically designed to prepare CNSs, based on the advanced nursing practice competencies and specialty practice. To ensure the clarity of these roles, it is important to develop proposals for CNS and NP positions at the local level that clearly identify the need for the role based on a needs assessment, define the role that best meets the identified needs and goals, plainly describe the role (Bryant-Lukosius and DiCenso 2004; DiCenso et al. 2003), and identify the team strategy for incorporating the role and how it will fit in the specific setting (Matthews et al. 2007). Determination of the healthcare team's practice styles and willingness to accept a new role is important in establishing future role clarity. Inclusion of healthcare team members and an NP or CNS in the planning and hiring process has the potential to increase awareness of the role, as well as the need for and consequently the acceptance of the role. Inadequate planning for role introduction is a particularly challenging issue for the CNS role because the role has multiple dimensions that enable it to address a broad range of patient, nursing, organizational and system needs. While the flexibility and responsiveness of NPs and CNSs to changing healthcare needs is advantageous for employers and patients, it can also be a liability if it contributes to lack of role clarity. Strategies to clarify NP and CNS roles and to communicate the responsive nature of the roles are needed at the national, provincial/territorial and local levels. Nursing leaders and administrators need specific knowledge about the CNS and NP roles to ensure that the right role is implemented to meet the identified needs (Gardner et al. 2007; Griffiths 2006). Role selection depends on knowing the needs, goals and general tasks required to meet the goals. In general, if the needs and goals of the position require a large component of direct patient care, with activities that are beyond the legislated scope of practice of the RN, then the NP is likely the best role to select (Griffiths 2006). If the position primarily requires quality improvement initiatives and nurse mentorship and consultation, with a smaller component of patient care, then the CNS is likely the best role to select. Healthcare team members, including nurses, are not aware of the CNS and NP scope of practice. A strategic communication plan within organizations, including detailed orientation for team members, nurses and physicians is essential to achieve a broad awareness and understanding of the CNS or NP role that is being introduced and how the role will be operationalized in that setting. The public's inadequate awareness of the roles (Forgeron and Martin-Misener 2005; Thrasher and Purc-Stephenson 2007) may lead to unclear role expectations on the part of patients, particularly with respect to hospital-based roles such as the CNS and ACNP. The application of knowledge translation and marketing principles can effectively guide a communication and marketing strategy for these two roles (Bero et al. 1998; Dobbins et al. 2004; Fraser Health n.d.; Graham et al. 2006; Kennaugh n.d.). Nursing associations can play a lead role in bringing together a Canada-wide advisory panel of knowledge transfer and marketing specialists, as well as members of the public, NPs, CNSs, key decision-makers and healthcare team members to examine available information regarding CNS and NP roles. This would include an assessment of likely barriers and facilitators to role implementation (Graham et al. 2006; Grol and Grimshaw 2003). Such an advisory panel could then build a clear and fully developed marketing plan, clarify similarities and differences between the roles, and ensure focused and consistent use of information in messages regarding the benefits of CNSs and NPs. Messages need to be tailored and packaged in different formats to target specific audiences with clear, concise and jargon-free language. Lack of role clarity may pose a threat to other healthcare providers; for example, a number of NP responsibilities overlap with functions traditionally associated with the physician role, such as prescribing medications and ordering laboratory and diagnostic tests. Flexibility and knowledge regarding collaboration are assets when negotiating new roles in the team (Barrett et al. 2007; Donald et al. 2009). As NP and physician roles are not the only roles that overlap, there is a general need to clarify functions and roles within a team based on patient and healthcare system needs and goals, while acknowledging individual skills and interests. The CNS and NP roles overlap in activities associated with advanced nursing practice competencies such as research, leadership, patient and staff education, care planning and community development. The overlap in functions between the CNS and nurse clinician or educator is also an area for discussion and clarification within the team, as both roles are typically involved in staff education, implementing change and providing leadership. Team members and the CNS and/or NP need to openly discuss the areas of role overlap and the benefits and points of confusion or concern regarding this overlap. As patient, provider and organizational needs change, team member roles may need to be renegotiated in order to clarify individual responsibilities and to avoid loss or duplication of specific components of patient care. Role overlap is not new to the healthcare team, nor is the need for clear communication and role delineation. Orientation for the healthcare team and the NP or CNS should flow from the planning process, with clear communication of the goals and fit. Written descriptions of the scope of practice, expectations and boundaries of the new role are helpful for team members. Time is needed for the CNS or NP to establish a relationship with the physicians and other healthcare team members and to understand practice styles and routines. Regularly scheduled team meetings to discuss existing and emerging patient needs and to negotiate the roles of team members in meeting the needs can enhance role clarity and team functioning for all team members. Title confusion and lack of role clarity pose major barriers when introducing CNS and NP roles. Specific recommendations from interview participants and the literature include the development of a vision statement that clearly articulates the role of CNSs and NPs across settings; the use of a systematic planning process to guide role development and implementation; the development of a strategic communication plan about NP and CNS roles for healthcare teams and the public; attention to inter-professional team dynamics when introducing these new roles; and the inclusion of components that address interprofessionalism in all health professional education program curricula. Consistent use of CNS and NP titles and clarity regarding roles will facilitate the full utilization of advanced practice nurses in the Canadian healthcare system. The synthesis from which this work was derived was made possible through joint funding by the Canadian Health Services Research Foundation and the Office of Nursing Policy in Health Canada. We thank the librarians who conducted searches of the electronic databases, Tom Flemming at McMaster University and Angella Lambrou at McGill University. Chris Cotoi and Rick Parrish in the Health Information Research Unit (HIRU) at McMaster University created the electronic literature extraction tool for the project. We thank all those who took time from their busy schedules to participate in key participant interviews and focus groups. The following staff members provided excellent support: Heather Baxter, Renee Charbonneau-Smith, R. James McKinlay, Dianna Pasic, Julie Vohra, Rose Vonau and Brandi Wasyluk. Special thanks go to our advisory board, roundtable participants and Dr. Brian Hutchison for their thoughtful feedback and suggestions. Advanced Practice Nursing Steering Committee, Winnipeg Regional Health Authority. 2005. A Guide to the Implementation of the Nurse Practitioner Role in Your Health Care Setting. Winnipeg, MB: Winnipeg Regional Health Authority. Retrieved August 28, 2009. <http://www.wrha.mb.ca/professionals/nursing/files/np_toolkit_000.pdf>. Advanced Practice Registered Nursing (APRN) Consensus Work Group and the National Council of State Boards of Nursing APRN Committee. 2008. July 7. Consensus Model for APRN Regulation: Licensure, Accreditation, Certification & Education. APRN Joint Dialogue Group Report. Chicago, IL: National Council of State Boards of Nursing. Retrieved August 28, 2009. <https://www.ncsbn.org/7_23_08_Consensue_APRN_Final.pdf>. Alcock, D.S. 1996. "The Clinical Nurse Specialist, Clinical Nurse Specialist/Nurse Practitioner and Other Titled Nurse in Ontario." Canadian Journal of Nursing Administration 9(1): 23–44. Avery, L., C. Hill-Carroll, M. Todoruk-Orchard and K. de Leon-Demare. 2006. Improve Patient Care and Outcomes: Adding a Clinical Nurse Specialist to Your Team. A Guide for Successful Integration. Winnipeg, MB: Winnipeg Regional Health Authority. Retrieved August 28, 2009. <http://www.wrha.mb.ca/professionals/nursing/files/cns_toolkit.pdf>. Barrett, J., V. Curran, L. Glynn and M. Godwin. 2007. CHSRF Synthesis: Interprofessional Collaboration and Quality Primary Healthcare. Ottawa, ON: Canadian Health Services Research Foundation. Retrieved December 28, 2010. <http://www.chsrf.ca/Migrated/PDF/SynthesisReport_E_FINAL.pdf>. Bero, L., R. Grilli, J.M. Grimshaw, E. Harvey, A.D. Oxman and M.A. Thomson. 1998. "Closing the Gap between Research and Practice: An Overview of Systematic Reviews of Interventions to Promote the Implementation of Research Findings." British Medical Journal 317(7156): 465–8. Besrour, S. 2002. L'équipe de première ligne: Une vision nouvelle, des nouvelles façons de faire. Montréal, QC: Université de Montréal. Retrieved December 28, 2010. <http://www.fcrss.ca/Migrated/PDF/ResearchReports/CommissionedResearch/record_f.pdf>. Bryant-Lukosius, D. 2004 and 2008. The Continuum of Advanced Practice Nursing Roles. Unpublished document. Bryant-Lukosius, D. and A. DiCenso. 2004. "A Framework for the Introduction and Evaluation of Advanced Practice Nursing Roles." Journal of Advanced Practice Nursing 48(5): 530–40. Bryant-Lukosius, D., A. DiCenso, G. Browne and J. Pinelli. 2004. "Advanced Practice Nursing Roles: Development, Implementation and Evaluation." Journal of Advanced Nursing 48(5): 519–29. Bryant-Lukosius, D., N. Carter, K. Kilpatrick, R. Martin-Misener, F. Donald, S. Kaasalainen, P. Harbman, I. Bourgeault and A. DiCenso. 2010. "The Clinical Nurse Specialist Role in Canada." Canadian Journal of Nursing Leadership 23(Special Issue December): 140–66. Canadian Association of Nurses in Oncology. 2001. Standards of Care, Roles in Oncology Nursing, Role Competencies. Ottawa, ON: Canadian Association of Nurses in Oncology. Canadian Institute for Health Information. 2010. Regulated Nurses: Canadian Trends, 2004-2008. Updated February 2010. Ottawa, ON: CIHI. Retrieved March 21, 2010. <http://secure.cihi.ca/cihiweb/products/regulated_nurses_2004_2008_en.pdf>. Canadian Institute for Health Information. 2008. Regulated Nurses in Canada: Trends of Registered Nurses. Ottawa, ON: CIHI. August 30, 2009. <http://secure.cihi.ca/cihiweb/products/chapter_1_rn_2003_to_2007_e.pdf>. Canadian Institute for Health Information and Canadian Nurses Association. 2006. The Regulation and Supply of Nurse Practitioners in Canada: 2006 Update. Ottawa, ON: CIHI. Retrieved September 21, 2009. <http://secure.cihi.ca/cihiweb/products/The_Nurse_Practitioner_Workforce_in_Canada_2006_Update_final.pdf>. Canadian Nurse Practitioner Initiative. 2005. Canadian Nurse Practitioner Initiative Technical Report: Practice Chapter. Retrieved December 15, 2010. Ottawa, ON: CNA. <http://www.cna-nurses.ca/CNA/documents/pdf/publications/cnpi/tech-report/section3/01_Practice%20Chapter.pdf>. Canadian Nurse Practitioner Initiative. 2006a. Nurse Practitioners: Implementation and Evaluation Toolkit for Nurse Practitioners in Canada. Ottawa, ON: CNA. Retrieved Aug 12, 2009. <http://www.cna-aiic.ca/CNA/documents/pdf/publications/Toolkit_Implementation_Evaluation_NP_e.pdf>. Canadian Nurse Practitioner Initiative. 2006b. Nurse Practitioners: The Time Is Now. A Solution to Improving Access and Reducing Wait Times in Canada. Ottawa, ON: CNA. Retrieved December 15, 2010.<http://www.cna-nurses.ca/CNA/documents/pdf/publications/cnpi/tech-report/section1/01_Integrated_Report.pdf>. Canadian Nurses Association. 2008. Advanced Nursing Practice: A National Framework. Ottawa, ON: CNA. Retrieved Aug 12, 2009. <http://www.cna-aiic.ca/CNA/documents/pdf/publications/ANP_National_Framework_e.pdf>. Canadian Nurses Association. 2009a. Position Statement: Clinical Nurse Specialist. Ottawa, ON: CNA. Retrieved Sept 17, 2009. <http://www.cna-nurses.ca/CNA/documents/pdf/publications/PS104_Clinical_Nurse_Specialist_e.pdf>. Canadian Nurses Association. 2009b. Position Statement: The Nurse Practitioner. Ottawa, ON: CNA. Retrieved April 5, 2010. <http://www.cna-aiic.ca/CNA/documents/pdf/publications/PS_Nurse_Practitioner_e.pdf>. Cancer Care Ontario Oncology APN Community of Practice. 2009. Clarifying the Advanced Oncology Nurse Role in Ontario. Toronto, ON: Cancer Care Ontario. Retrieved March 18, 2010. <https://ozone.scholarsportal.info/bitstream/1873/14179/1/290692.pdf>. Centre for Rural and Northern Health Research. n.d. Acute Care Nurse Practitioners in Ontario: Findings from the First Workforce Survey. Sudbury, ON: Centre for Rural and Northern Health Research, Laurentian University. Retrieved August 13, 2009. <http://www.cranhr.ca/pdf/focus/FOCUS06-A4.pdf>. College and Association of Registered Nurses of Alberta. 2006. Standard for the Use of the Title "Specialist" in Registered Nurse Practice. Edmonton, AB: College and Association of Registered Nurses of Alberta. Retrieved March 18, 2010. <http://www.nurses.ab.ca/Carna-Admin/Uploads/Use%20of%20the%20Title%20Specialist.pdf>. College and Association of Registered Nurses of Alberta. n.d. "Attachment #1." Background Information: Proposal to Amend the Registered Nurses Profession Regulation to Require Master's Preparation for Initial Entry to Practice as a Nurse Practitioner. Edmonton, AB: College and Association of Registered Nurses of Alberta. College of Nurses of Ontario. 2007. Registration in the Extended Class for Nurses in Ontario. Toronto, ON: College of Nurses of Ontario. Retrieved November 15, 2010. <http://www.cno.org/Global/docs/reg/41077_rnecRegGuide.pdf>. Davies, B. and B. Eng. 1995. "Implementation of the CNS Role in Vancouver, British Columbia, Canada." Clinical Nurse Specialist 9(1): 23–30. de Leon-Demare, K., K. Chalmers and D. Askin. 1999. "Advanced Practice Nursing in Canada: Has the Time Really Come?" Nursing Standard 14(7): 49–54. Desrosiers, G. 2007. "La Loi 90: des retombés pour l'ensemble des infirmières." [editorial] Perspectives Infirmières 4(3): 6–8. Retrieved August 13, 2009. <http://www.oiiq.org/uploads/periodiques/Perspective/vol4no3/editoF.pdf>. DiCenso, A. 2008. "Roles, Research & Resilience: The Evolution of Advanced Practice Nursing." The Canadian Nurse 104(9): 37. DiCenso, A., L. Auffrey, D. Bryant-Lukosius, F. Donald, R. Martin-Misener and S. Matthews and J. Opsteen. 2007. "Primary Health Care Nurse Practitioners in Canada." Contemporary Nurse 26(1): 104–15. DiCenso, A., D. Bryant-Lukosius, I. Bourgeault, R. Martin-Misener, F. Donald, J. Abelson, S. Kaasalainen, K. Kilpatrick, S. Kioke, N. Carter and P. Harbman. 2010a. Clinical Nurse Specialists and Nurse Practitioners in Canada: A Decision Support Synthesis. Ottawa, ON: Canadian Health Services Research Foundation. Retrieved December 28, 2010. <http://www.chsrf.ca/SearchResultsNews/10-06-01/b9cb9576-6140-4954-aa57-2b81c1350936.aspx>. DiCenso, A., R. Martin-Misener, D. Bryant-Lukosius, I. Bourgeault, K. Kilpatrick, F. Donald, S. Kaasalainen, P. Harbman, N. Carter, S. Kioke, J. Abelson, R.J. McKinlay, D. Pasic, B. Wasyluk, J. Vohra and R. Charbonneau-Smith. 2010b. "Advanced Practice Nursing in Canada: Overview of a Decision Support Synthesis." Canadian Journal of Nursing Leadership 23(Special Issue December): 15–34. DiCenso, A., G. Paech and IBM Corporation. 2003. Report on the Integration of Primary Health Care Nurse Practitioners into the Province of Ontario. Toronto, ON: Ministry of Health and Long-Term Care. Retrieved August 12, 2009. <http://www.health.gov.on.ca/english/public/pub/ministry_reports/nurseprac03/nurseprac03_mn.html>. Dobbins, M., K. DeCorby and T. Twiddy. 2004. "A Knowledge Transfer Strategy for Public Health Decision Makers." Worldviews on Evidence-Based Nursing 1(2):120–8. Donald, F., E.A. Mohide, A. DiCenso, K. Brazil, M. Stephenson and N. Akhtar-Danesh. 2009. "Nurse Practitioner and Physician Collaboration in Long-Term Care Homes: Survey Results." Canadian Journal on Aging 28(1): 77–87. Fayerman, P. 2008, July 24. "B.C. Boasts 100 Nurse Practitioners." The Vancouver Sun. Vancouver, BC: Canada.com. Retrieved March 31, 2010. <http://www.canada.com/vancouversun/news/westcoastnews/story.html?id=b57b8ccb-ccfe-429a-a45f-9f25a77141e8>. Forgeron, P. and R. Martin-Misener. 2005. "Parents' Intentions to Use Paediatric Nurse Practitioners in an Emergency Department." Journal of Advanced Nursing 52(3): 231–8. Fraser Health. n.d. Three Page Summary of Proven KTE Strategies- Literature Review: What Are Proven Knowledge Transfer and Exchange (KTE) Strategies? Retrieved March 19, 2010. <http://research.fraserhealth.ca/media/2009%20May%2014%20%20Proven%20KTE%20Strategies%20%20%203-page%20Summary.pdf>. Fulton, J.S. and K. Baldwin. 2004. "An Annotated Bibliography Reflecting CNS Practice and Outcomes." Clinical Nurse Specialist 18(1): 21–39. Gardner, G., A. Chang and C. Duffield. 2007. "Making Nursing Work: Breaking through the Role Confusion of Advanced Practice Nursing." Journal of Advanced Nursing 57(4): 382–91. Goss Gilroy Inc. Management Consultants. 2001. Report on the Evaluation of Implementation of the Role of Nurse Practitioner Primary Health Care in Newfoundland and Labrador. St. John's, NL: Health and Community Services Province of Newfoundland and Labrador. Graham, I.D., J. Logan, J. M. Harrison, S. Straus, J. Tetroe and W. Caswell and N. Robinson. 2006. "Lost in Translation: Time for a Map?" The Journal of Continuing Education in the Health Professions 26(1): 13–24. Griffiths, H. 2006. "Advanced Nursing Practice: Enter the Nurse Practitioner." Nursing BC 38(2): 12–6. Grol, R. and J. Grimshaw. 2003. "From Best Evidence to Best Practice: Effective Implementation of Change in Patients' Care." The Lancet 362(9391): 1225–30. Haines, J. 1993. The Nurse Practitioner – A Discussion Paper. Ottawa, ON: Canadian Nurses Association. Unpublished paper. Harris/Decima. 2009, August 13. Canadians Very Comfortable with Expanded Role for Nurse Practitioners. [Press release] Ottawa, ON: Harris/Decima. Retrieved March 21, 2010. <http://www.rorrhs-ohhrrn.ca/index.php?option=com_content&view=article&id=14%3Acanadians-very-comfortable-with-expanded-role-for-nurse-practitioners&catid=10&Itemid=8&lang=en>. Higuchi, K.A., B. Hagen, S. Brown and M.P. Zieber. 2006. "A New Role for Advanced Practice Nurses in Canada: Bridging the Gap in Health Services for Rural Older Adults." Journal of Gerontological Nursing 32(7): 49–55. Horrocks, S., E. Anderson and C. Salisbury. 2002. "Systematic Review of Whether Nurse Practitioners Working in Primary Care Can Provide Equivalent Care to Doctors." British Medical Journal 324(7341): 819–23. International Council of Nurses. 2008. The Scope of Practice, Standards and Competencies of the Advanced Practice Nurse. Geneva: International Council of Nurses. Irvine, D., S. Sidani, H. Porter, L. O'Brien-Pallas, B. Simpson and L. McGillis Hall, J. Graydon, A. DiCenso, D. Redelmeir and L. Nagel. 2000. "Organizational Factors Influencing Nurse Practitioners' Role Implementation in Acute Care Settings." Canadian Journal of Nursing Leadership 13(3): 28–35. Retrieved October 2, 2009. <http://www.longwoods.com/content/16304>. Jones, L. and D. Way. 2004. Practice Component: Literature Review Report. Delivering Primary Health Care to Canadians: Nurse Practitioners and Physicians in Collaboration. Ottawa, ON: Canadian Nurses Association and Canadian Nurse Practitioner Initiative. Retrieved December 15, 2010. <http://web.archive.org/web/20060807182745/www.cnpi.ca/documents/pdf/Models_of_Collaboration_Literature_Review_e.pdf>. Kennaugh, C. n.d. Develop an Effective Marketing Strategy. Retrieved August 13, 2009. <http://office.microsoft.com/en-us/help/HA011426421033.aspx>. Kilpatrick, K., P. Harbman, N. Carter, R. Martin-Misener, D. Bryant-Lukosius, F. Donald, S. Kaasalainen, I. Bourgeault and A. DiCenso. 2010. "The Acute Care Nurse Practitioner Role in Canada." Canadian Journal of Nursing Leadership 23(Special Issue December): 114–39. Lloyd Jones, M. 2005. "Role Development and Effective Practice in Specialist and Advanced Practice Roles in Acute Hospital Settings: Systematic Review and Meta-Synthesis." Journal of Advanced Nursing 49(2): 191–209. Martin-Misener, R., D. Bryant-Lukosius, P. Harbman, F. Donald, S. Kaasalainen, N. Carter, K. Kilpatrick and A. DiCenso. 2010. "Education of Advanced Practice Nurses in Canada." Canadian Journal of Nursing Leadership 23(Special Issue December): 61–84. Matthews, S., A. DiCenso and the Nurse Practitioner Integration Task Team. 2007. Report of the Nurse Practitioner Integration Task Team submitted to the Ontario Minister of Health and Long-Term Care. Retrieved March 31, 2010. <http://health.gov.on.ca/english/providers/program/nursing_sec/docs/report_task_team_2007.pdf>. McAiney, C.A., D. Haughton, J. Jennings, D. Farr, L. Hillier and P. Morden. 2008. "A Unique Practice Model for Nurse Practitioners in Long-Term Care Homes." Journal of Advanced Nursing 62(5): 562–71. McNamara, S., V. Giguère, L. St-Louis and J. Boileau. 2009. "Development and Implementation of the Specialized Nurse Practitioner Role: Use of the PEPPA Framework to Achieve Success." Nursing and Health Sciences 11(3): 318–25. NPCanada.ca. 2008. Nurse Practitioner Video Prepared by the NP Association of Nova Scotia. Retrieved March 31, 2010. <http://www.npcanada.ca/portal/files/NPNovaScotia.wmv>. Registered Nurses' Association of Nova Scotia. 1999. Position Paper on Advanced Nursing Practice. Halifax, NS: Registered Nurses' Association of Nova Scotia. Retrieved August 12, 2009. <http://www.crnns.ca/documents/advancednursing.pdf>. Robarts, S., D. Kennedy, A.M. MacLeod, H. Findlay and J. Gollish. 2008. "A Framework for the Development and Implementation of an Advanced Practice Role for Physiotherapists that Improves Access and Quality of Care for Patients." Healthcare Quarterly 11(2): 67–75. Roschkov, S., D. Rebeyka, A. Comeau, J. Mah, K. Scherr and M. Smigorowsky and J. Stoop. 2007. "Cardiovascular Nurse Practitioner Practice: Results of a Canada-wide Survey." Canadian Journal of Cardiovascular Nursing 17(3): 27–31. Schreiber, R., H. Davidson, M. MacDonald, J. Crickmore, L. Moss and J. Pinelli. 2003. Advanced Nursing Practice: Opportunities and Challenges in British Columbia. Ottawa, ON: Canadian Health Services Research Foundation. Retrieved December 28, 2010. <http://www.chsrf.ca/Migrated/PDF/ResearchReports/OGC/schreiber_report.pdf>. Schreiber, R., M. MacDonald, B. Pauly, H. Davidson, J. Crickmore, L. Moss, J. Pinelli and S. Regan. 2005a. "Singing from the Same Songbook: The Future of Advanced Nursing Practice in British Columbia." Canadian Journal of Nursing Leadership 8(2). Retrieved March 23, 2010. <http://www.longwoods.com/content/19027>. Schreiber, R., M. MacDonald, B. Pauly, H. Davidson, J. Crickmore, L. Moss, J. Pinelli, S. Regan and C. Hammond. 2005b. "Singing in Different Keys: Enactment of Advanced Nursing Practice in British Columbia." Canadian Journal of Nursing Leadership 18(2). Retrieved March 23, 2010. <http://www.longwoods.com/content/19026>. Thrasher, C. and R.J. Purc-Stephenson. 2007. "Integrating Nurse Practitioners into Canadian Emergency Departments: A Qualitative Study of Barriers and Recommendations." Canadian Journal of Emergency Medicine 9(4): 275–81.